Donald Trump entered Wednesday night’s presidential debate with his campaign in crisis mode. As sexual assault allegations and an endless parade of scandals beset the GOP nominee, the likelihood that he will suffer a landslide defeat on Nov. 8 grows by the day. A steady drum beat of national polls now show him trailing Hillary Clinton by a large margin, with some polls even showing her ahead by double digits. Wednesday night’s debate, therefore, provided Trump with one final opportunity to rescue his flagging campaign. It also provided Clinton with one last chance to make her case to a national audience. Despite the dramatic build-up, the result was anticlimactic. After two intense and volatile debates, the third and final debate offered only a few moments of drama. But that was good news for Clinton. As the frontrunner, she didn’t need to win the debate. She just needed to survive it without any major gaffes, and she accomplished that goal. Trump, in contrast, made the one major gaffe of the night. In an extraordinary and indefensible departure from historical precedent, Trump refused to agree in advance to accept the results of the presidential election. By preemptively assuming the role of sore loser, Trump signaled to the whole world that he expects to lose on election day. Clinton, in contrast, seemed more relaxed than in previous debates. Undoubtedly she has read the same polls that Trump has. She knows as well as anyone that the trend lines are moving unmistakably in her favor. For the remainder of the debate, Trump did a reasonably effective job of launching zingers at Clinton, particularly with regard to her own history of scandals and mistakes. But Clinton had plenty of good lines of her own. She claimed that Trump “choked” when he met with the Mexican president and failed to bring up the border wall issue. She also accused Trump of being a “puppet” of Russian president Vladimir Putin. In the end there was almost nothing said by the candidates that was new. They both resorted to long-standing talking points, and even repeated verbatim statements they had made in previous debates. Consequently, Wednesday night’s debate will probably not make much of an impact on the presidential race, which is an outcome the Clinton campaign should be quite happy with. Clinton entered the debate with the wind at her back. On Wednesday night the New York Times Upshot forecast gave Clinton a 92 percent chance of winning the election. The Upshot’s prediction is strikingly similar to the forecasts of most other leading political analysts. Wednesday’s inconclusive debate won’t change those forecasts. Instead, it seems the only question now is how large Clinton’s victory will be. The closing days of the campaign bear all the hallmarks of an impending landslide. Clinton has a decisive lead in most of the key battleground states and holds a virtually insurmountable position in the Electoral College. Most remarkable of all, the latest polling data suggests that Clinton could win some of the most conservative states in the country, including Arizona, Georgia, and Alaska. Even Utah is up for grabs. Republicans only have themselves to blame for the predicament they find themselves in. By any measure, Hillary Clinton is one of the most personally unpopular presidential candidates in history. The polls have consistently demonstrated that over 50 percent of Americans view her unfavorably. It seems likely that a mainstream Republican candidate, such as Ohio Gov. John Kasich or former Florida Gov. Jeb Bush, could have easily defeated Clinton. But Republican primary voters had no interest in pragmatic establishment candidates like Kasich and Bush. Instead Republicans chose as their nominee the one person in the country more unpopular than Hillary Clinton. The polls have consistently shown that over 60 percent of Americans view Donald Trump unfavorably, the highest negative rating of any presidential nominee in history. Although Trump performed competently on Wednesday night, his debate performance will not erase from voters’ memories the crude, bigoted, and brazenly dishonest campaign he has waged since entering the presidential race with a xenophobic attack on Mexicans. Trump’s racist and sexist populism may have resonated with Republican primary voters, but it seems all but certain that it will flop with general election voters. If Trump does indeed lose badly, his campaign will represent a self-inflicted wound on a massive scale for the Republican Party, a devastating blunder without parallel in modern American politics. As the outcome of the presidential election becomes increasingly clear, the focus of the media’s attention will turn to the Senate and House races. The latest polls suggest that the Democrats have a slightly better than even chance of netting the four seats they need to take operational control of the Senate. The House, however, is a different story. Thus far, Trump’s calamitous campaign has not inflicted severe down ballot damage on Republican congressional candidates. The reason is in part because of gerrymandering, which gives incumbent Republicans very favorable district lines. Thus, although Congress has an abysmal approval rating of 18 percent, only 31 of the 247 House seats held by Republicans will be seriously contested on Nov. 8. The bottom line is most political analysts expect that the Democrats will have a net pick up of about 15 seats, which is well short of the 30 they need to take the House. But the jury is still out on the Democrats’ effort to win the House majority. When wave elections happen in congressional races, the momentum usually doesn’t show up in the polls until late October. For example, exactly 10 years ago, Republicans appeared certain to maintain their Congressional majority in mid-October 2006. But popular anger over the Iraq War and GOP scandals led to a late collapse in support for Republican incumbents, resulting in a stunning Democratic take over of both the House and the Senate. History could repeat in 2016. A new Brookings Institute poll suggests that Democratic congressional candidates have surged to a 12-point lead on the generic ballot, which is the first indication that a Democratic wave could be taking shape. And just last week the Republican House Speaker Paul Ryan publicly speculated about a “nightmare” scenario in which Democrats could win control of the House. 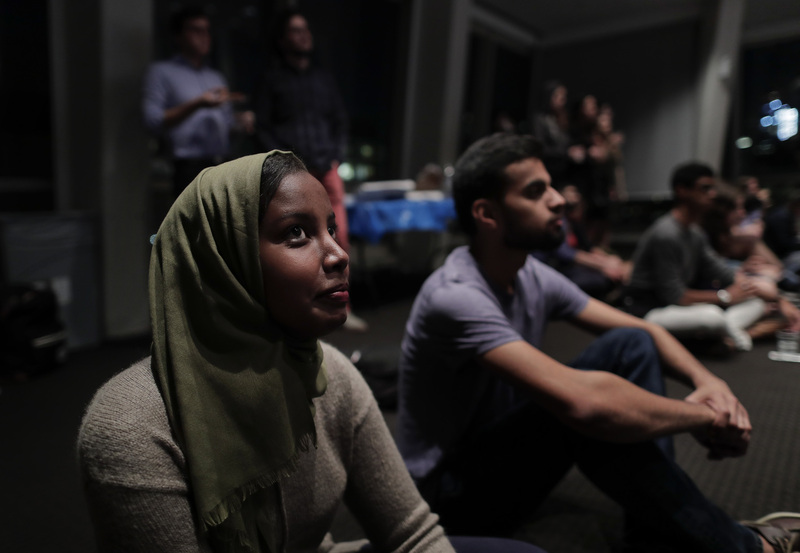 Fadumo Osman, left, political director for NYU College Democrats, watches the presidential debate, Oct. 19, 2016. Regardless of how the congressional races play out, the most pressing issue to emerge from Wednesday night’s debate is Trump’s irresponsible threat to challenge the legitimacy of the election’s outcome. It’s clear he expects to lose. But what’s not clear yet is how much damage he will do to public confidence in the election system before his campaign is finally over. The 2016 election is already the ugliest presidential campaign in modern history and unfortunately it appears the final chapter hasn’t even been written yet.